One of the greatest amateur boxers of all times, formidable Cuban heavyweight passed away six years ago. The three-times Olympic champion, Teófilo Stevenson was a drunkard all right. Therefore, he died relatively early, reportedly being slightly over sixty years old. Why I has mentioned his age with a tint of doubt? Well, there is a Kazakh light flyweight boxer Bolat Sagyndykov (1950- ), who won the USSR Cup, 1970. He contested in the 48 kilos weight category. Mr. Sagyndykov also participated in an international tournament Olympic Hopes, 1970, where he won the third place. More importantly, he befriended Mr. Stevenson there. The Kazakh boxer recollects that during a basketball workout the Cuban giant sometimes caught Mr. Sagyndykov’s head under his armpit, funnily mistaking it for the ball. In the spring of 2017, I met Mr. Sagyndykov in Almaty. We discussed boxing topics. Among other things, he insisted that Mr. Stevenson was born in 1950: “We are of the same age. I know it for sure”. Well, the overwhelming majority of sources have told us that Mr. Stevenson was born in 1950. Although, his Kazakh friend names the different date. Perhaps, Mr. Sagyndykov means an illegal rejuvenation, whereby some athletes officialy reduce their actual age. In doing so, they get a competitive advantage over their rivals. This practice is especially popular in the former Soviet Union. For instance, when a 20-year old boxer competes in a youth tournament as an 18-year old teenager, he definitely has more chances to prevail over his younger opponents. Who knows? Maybe, the great Cuban pugilist also unlawfully corrected his actual age. But, even so, his triumphant senior victories totally acquitted his possible misconduct at the start of his stellar career. 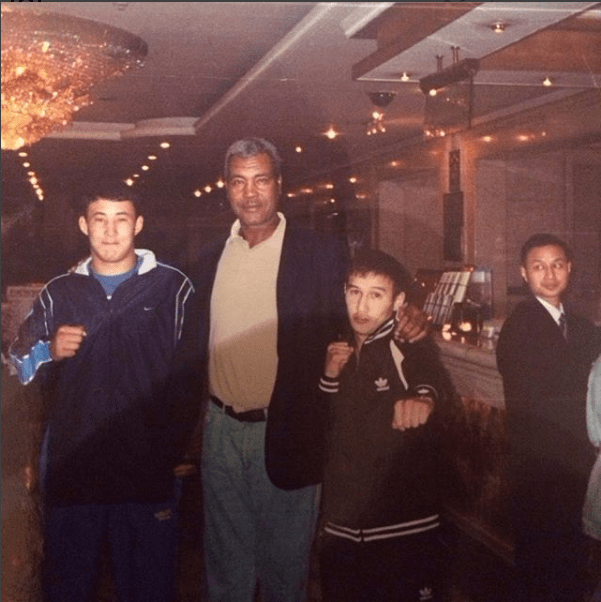 In the 1990s-2000s, Mr. Stevenson visited Kazakhstan several times as an honorary guest of boxing tournaments. The above photo was made in 2005 during the world boxing championships in China. 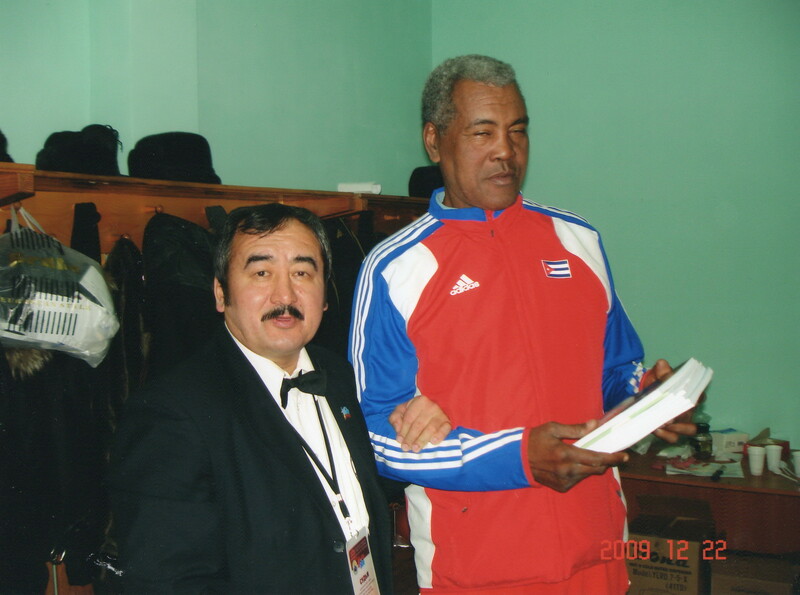 A Kazakh heavyweight Ruslan Myrsatayev, then competing for Kyrgyzstan, was proud to stand by the Cuban legend. The below photo was made in 2009. An Uighur referee and boxing scholar Khamit Barayev, residing in Kazakhstan, also was glad to be with Mr. Stevenson.